Are the US and the EU Sponsoring Terrorism in Burundi? Since protests broke out in Burundi’s capital Bujumbura in April 25th 2015 against the decision of the ruling party to nominate the country’s leader Pierre Nkurunziza for a third term as president, the international press has published reports suggesting that the country is on the verge of civil war, as president Nkurunziza, portrayed as a dictator attempting to hold on to power, is confronted with an ever increasing movement of ‘peaceful protesters’, ‘human rights’ and ‘civil society’ activists who have an almost absolute monopoly on reportage concerning Burundi’s electoral controversy. It seems a consensus has rapidly been reached concerning who the good and bad guys are in this conflict. But all is not what is seems. In fact, the East African nation is currently experiencing the culmination of a US/EU backed regime change programme which has been conducted as a low-intensity media and covert operations war since 2005. The objective of this war is to redraw the map of the resource-rich Great Lake’s region of Central Africa in accordance with Western corporate and geostrategic interests. The current incumbent Pierre Nkurunziza joined the National Council for the Defense of Democracy, Forces for the Defense for Democracy (CNDD-FDD) after the brutal murder of left-wing president Melchior Ndadaye in 1993, the country’s first democratically elected leader who stemmed from the Hutu, ethnic majority in the former German and Belgian colony. Burundi was traditionally ruled by the Tutsi minority ethnic group, whose elites ruled the country in the interests of European colonialism. Nkurunziza lost many members of his own family during the genocide of the Hutus by the Tutsi military regime which plunged the country into a decade long civil war causing the death of over 300,000 people. 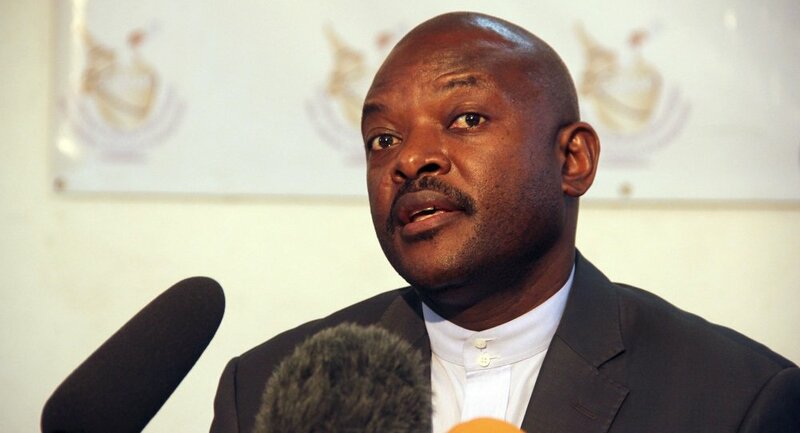 Nkurunziza’s rebel movement signed an agreement with the Tutsi-dominated government of Burundi in Arusha, Tanzania in August 2000, according to which a transition government of power-sharing between Hutus, Tutsis and Twa would be put in place. Although in power since 2005, sensu strictu, the country only became a democracy during the election of 2010, where Nkurunziza’s CNDD won a landslide victory. It is on this basis that Burundi’s constitutional council, the supreme legal authority in the country, judged correctly that the incumbent has the right to be nominated for another electoral term. Western backed opposition activists have admitted that the government has not violated the constitution, but insist instead that the constitutional council is corrupt as its members were nominated by the president. No one would claim, for example, that the French constitutional council is corrupt because its members are nominated by the President of the French Republic. But in the case of Africa, constitutional councils are regularly scoffed at by Western powers when their decisions do not conform to neo-colonial interests and neo-colonial interests, not disputes over interpretations of the country’s constitution, are the key issue in the current Burundian crisis. Since coming to power in 2005, Pierre Nkurunziza has done a remarkable job in re-uniting and re-building a country ruined by internecine war. A fanatical supporter of football, the former physical sports teacher has been rewarded by many peace organizations throughout the world for his use of football as a means of bringing Hutu and Tutsi communities together. Education has also been a key focus of the Nkurunziza administration. Burundi has built more schools since 2007 than any previous government since independence almost 50 years ago. Nkurunziza wants to transform Burundi’s economy into a major exporter of fruit and has implemented an ambitious fruit tree plantation programme to this effect. The Burundian president spends much of his time doing manual work with the peasants of Burundi. After coming to power, the Burundian government passed a law according to which citizens are required to preform community labour on Saturdays in order to expedite the construction of vital public infrastructure. A key role in this endeavour is played by the Imbonerakure, the youth wing of the ruling CNDD party. The Burundian government has made modest progress in reducing poverty, and has promised to increase economic growth from 4.5 percent to 8.5 percent from 2015 from investments made in nickel mining, fruit production and tourism. Burundi’s success in the fight against malaria has been due to the construction of health centres throughout the country, the provision of free health care for children under five years old and pregnant mothers. Deeply patriotic and highly popular, having fought a long battle for his country’s liberation, Nkurunziza has succeeded in creating a modest form of national voluntarism, nascent self-reliance and a sense of optimism about the country’s future. He has increased ties with China, India and Brazil, while adroitly taking advantage of inter-imperialist rivalry for access to African markets by signing several important trade deals with Japan. Indeed, due to the implacable hostility of the neocolonial powers and their press agencies, Burundi will now most likely have no choice but to increase its links with the BRICS powers. Nkurunziza’s decision in 2010 to sign an agreement with Beijing that provides for closer Sino-Burundian military cooperation is of tremendous significance. Closer relations with China will enable Burundi to strengthen its defense forces from what Burundian patriots refer to as the BHBFC, the Burundi-Hima-Belgian-French Connection, that is to say, the incessant hostility of the neo-colonial powers and their local collaborators. Who are the Burundian opposition? The opposition party Movement for Solidary and Democracy (MSD), part of the umbrella organization, the Alliance for Democratic Change Ikibiri (ADC Ikibiri) is led by Alexis Sinduhije. He is a protégé of US ambassador to the United Nations Samantha Power. In the general election of 2010 the The MSD withdrew from the electoral process after gaining a mer 4 percent of the popular vote. They claimed the elections were unfair, in spite of the fact that international observers did not report any irregularities. Sinduhije has been accused of terrorism by the Burundi government after it was revealed that he was forcibly recruiting youths in the Democratic Republic of Congo’s Eastern Kivu region for the formation of a rebel group with a view to seizing power in Bujumbura. Sinduhije has little popular support inside Burundi but he does have the support of the European Union and the United States, who never wanted the Hutu majority to rule Burundi, as imperial divide and rule policy dictates that post-colonial countries should remain internally divided on ethnic lines with a militarized minority constituting a neo-colonial comprador bourgeoisie eternally dependent on their foreign masters. Francois Nyamoya is the secretary general of the Movement for Solidary and Democracy. He is also the son of Albin Nyamoya, one of the generals involved in the 1972 genocide of the Hutus under the Micombero regime. A 2011 UN report on the situation in Eastern Congo identifies many of the so-called Burundian oppositionists as involved in smuggling of gold and terrorizing the inhabitants of Southern Kivu. None of these fake opposition parties should be confused with the 17 democratically elected deputies of the opposition party Uprona. As in the case of Syria, one must distinguish between the legally constituted opposition and the US and European sponsored gangster networks posing as oppositionists. During the 1980s the Pentagon trained Rwandan Major General Paul Kagame at the US Army Command and Staff College (CGSC) Fortleavenworth, Kansas. Kagame’s Rwandan Patriotic Forces invaded Rwanda from Uganda between 1990 and 1994, assassinating two Hutu leaders, President Cyprien Ntaryamira of Burundi and President Juvenal Habyarimana of Rwanda. An impressive US led propaganda campaign has presented Paul Kagame as the man who put an end to the genocide in Rwanda, whereas in fact it was Kagame’ forces with full US and Israeli backing who perpetrated most of the mass killings Hutus, Tutsi and Twa blaming all of their crimes on the majority Hutu government. Kagame’s regime is one of the proxy-forces being used by the United States and the European Union to destabilize and overthrow the democratically elected government of Burundi. Many researchers in Burundi suspect that the CIA may have been behind the assassination of President Melchior Ndadaye in 1993, given the fact that they directed Kagame who ordered the murder of Ndadaye’s successor Cyprien Ntaramira a year later. The US government is acutely aware that if the people of Burundi are to know the truth about the US-backed genocide of the Hutus in Rwanda and Burundi, it could jeopardize their foreign policy objectives in the region. Managing people’s perspectives and memory of their own suffering due to US imperialism is a key component of the Pentagon’s strategy in parts of the world it controls. That is why a suitable criminal to replace president Nkurunziza must be found and the CIA database of military intelligence assets is filling up with warlords and war criminals from the Congolese Armageddon, where several million people have been murdered since the US proxy invasion of 1996. Burundian democracy is currently threatened by two main instruments of Western imperial policy: terrorism and colour revolutions. One of the world’s poorest countries, Burundi could not possibly hope to compete with the barrage of media disinformation waged against it since the Nkurunziza’s election victory in 2010. Many activists and pseudo-journalists funded by the NED have been arrested by the Burundian authorities on charges of fomenting ethnic tension and promoting terrorist groups in collaboration with the enemies of the country, a crime prohibited by all internationally recognized nation-states. Terrorist groups who have attacked Burundi in recent years have received extensive and positive coverage from the Francophone media. For example, in a report entitled ‘Retour de la Rebellion’ French journalist Pauline Simonet reported on a ‘rebel’ group in Eastern Congo, who are hoping to invade and seize power in Burundi. The terrorist group was presented in a positive light, while the point of view of the Burundian government was dismissed. The message was clear: the ‘rebels’ have a just cause and are worthy of our sympathy. The report also mentioned the massacre of Gatumba of the 18 and 19th of September 2013 where several civilians were murdered outside the Burundian capital. The Burundian National Intelligence Service (SNR) blamed the attack on the Forces for National Liberation (FLN), a terrorist group based in the neighbouring Democratic Republic of Congo (DRC) and headed by warlord Agathon Rwasa, whom UN investigators have accused of gold smuggling. The France 24 team seems to be unaware of official UN investigations. Rwasa is a former opposition candidate from the ACD-Ikibiri coalition and a full time criminal who ran against Nkununziza in 2010, lost miserably, declared the election to be false, fled to the Congo and returned to his specialization: terrorism. Lucien Rukevya, a journalist with Radio France Internationale’s Swahili section was arrested on June 16th 2013 while embedded with a Burundian terrorist group. He was charged with complicity in the promotion of terrorism against the Burundian state. The French media and associated ‘human rights’ groups, did their best to justify this young man’s flagrant and criminal violation of journalistic professionalism, in order to accuse the Burundian government of cracking down on ‘free speech’. In September 9th 2013 ‘journalist’ Hassan Rovakuki was also arrested for complicity in terrorism. The charge of the Burundian government against these journalists is that they are spreading propaganda in favour of criminals who are attempting to declare war on the people of Burundi. This is in the context of a poor country whose existence is being constantly threatened by militia on its borders in the service of neo-colonial powers, who have not disguised their wish to implement ‘regime change’ in Bujumbura. Any serious researcher who reads these press dispatches on the so-called Burundian ‘rebels’ operating from the DRC would have to agree that the reports are incontrovertibly biased against the government of Burundi. All of the reports emphasize the arguments of the rebels while attempting to dismiss those of the government. This is in violation of the most basic rule in journalism: objectivity. Furthermore, such biased, mendacious and aggressive reporting by the agencies of the most powerful countries in the world against a defenseless developing nation constitutes nothing less than acts of psychological terrorism. 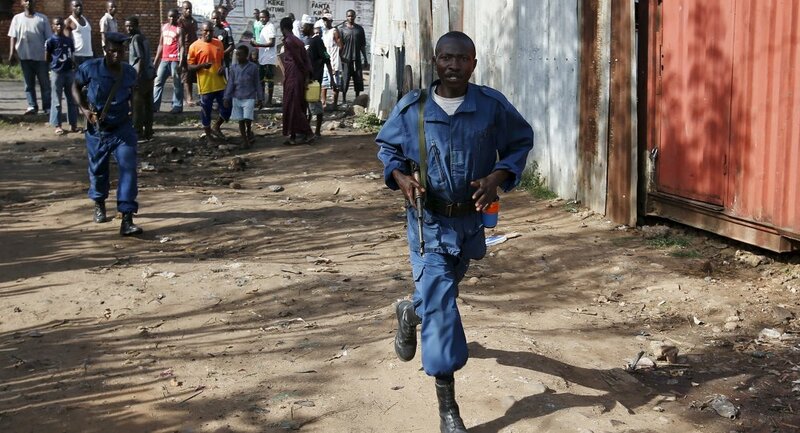 On March 8th 2014 an armed insurrection was organized by the opposition in Bujumbura. Police were attacked and kidnapped in what was a clear attempt to seize power. The contrast between citizens throughout the country engaged in community labour in an attempt to rebuild a broken country and a group of fascist thugs attempting to plunge the country into chaos could not have been more poignant. Needless to say, the United States expressed ‘concern’ about the ‘brutal’ crackdown on their putschists. On December 30th 2014, Burundi’s Northern Province of Cibitoke, on the border with Rwanda and the Democratic Republic of Congo was invaded by a terrorist gang. It took the Burundian National Defense Forces four days to defeat the invasion. Many of the terrorists were captured and a spokesman for the army in a press conference after the incident assured reporters that they would be treated according to international humanitarian law. Meanwhile the NED funded media outlets in the country were zealously spreading pro-rebel propaganda, even publishing photos of dead Shebaab rebels in Kenya, claiming they were Burundian prisoners of war ‘massacred’ by the Burundian military. The European Union and the United States have shamelessly expressed ‘human rights’ concerns about the Burundian government’s defeat of the foreign-backed invasion, while showing no concern for their victims. The international Francophone press was also vociferous in it condemnation of the arrest in January 2015 of Rob Rugurika, the director of Radio Publique Afrique, a privately-funded ‘opposition’ radio station, after he accused the government of ordering the massacre of three Italian nuns in Kamenge in 2014. Rugurika, who has links with terrorist groups outside the country, has been accused by the Burundian judiciary of being part of a conspiracy to commit crimes and blame them on the government in a destabilization campaign backed by foreign powers. In September 2014, 40 bodies were found floating on Lake Rweru between Rwanda and Burundi. Villagers upriver in Rwanda fled from French journalists when they attempted to investigate the crime. They told RFI that they had been warned by the Rwandan authorities not to speak to journalists about what they had seen. In spite of the fact that Burundian authorities could not have been behind the crime, US-funded opposition media inside Burundi continue to peddle all sorts of lies suggesting that the corpses might have been oppositionists murdered by the Burundian government. The US-funded media disinformation campaign is part of the prelude to the mobilization of street protests against the government that can be presented to the world as a ‘popular uprising’against a ‘dictator’ who is ‘killing his own people’ It is a techinique that has been perfected by US ‘democracy’and ‘civil society’ NGOS. This phenomenon is what Italian Marxist philosopher Antonio Gramsci referred to as the ‘takeover of politics by civil society’, that is to say, the destruction of the political sphere and the agora of human agency and social progress by the absolutism of corporate exploitation. Since the US-backed people-power coups in North Africa in 2011, the US ‘youth industry’, this anti-politics of destruction, has spread its tentacles throughout the African continent, where, paradoxically, ‘anti-corruption’ and ‘down-with-the-dictator’ activism further entrenches imperialism by contriving a discourse on social discontent that obfuscates its material basis, thereby dis-empowering and corrupting the youth. We could call this phenomenon the stultification of dissent. The aim of terrorism and people-power coups or colour revolutions is to render nations of the Global South powerless in the face of globalization. It is a deeply cynical but nevertheless ingenious US foreign policy programme, which, due to the fact that so many critics of US foreign policy continue to believe that the Arab Spring was a genuinely ‘spontaneous uprising’ of the masses against US-backed dictators, attests to the sophistication and prescience of the US foreign-policy establishment. The United States and the European Union are at war against the people of Burundi. Situated at the heart of the mineral rich Great Lakes region of Africa, the democratic government of Burundi is an obstacle to the depopulation programme currently being carried out by US client dictator Paul Kagame of Rwanda and his partner Yoweri Museveni of Uganda, who are attempting to carve up Eastern Congo in order to create an independent Republic of Kivu, bringing that region’s vast wealth into the possession of European and American corporate interests. In October 2014 the Burundian military were forced to withdraw by the United Nations ‘peace-keeping’ force MONUSCO from Kiliba in Eastern Congo where they had been cracking down on terrorist groups. Shortyly thereafter, the Burundian authorities arrested several NED funded activists ,who were busy spreading absurd lies about the Burundian military training pro-government Burundian youth( the imbonerakure) in the Congo for the purposes of terrorizing the Burundian population at home. These lies were meant to incite fear and ethnic hatred among the population, in order to weaken the credibility of the government. This withdrawal from the DRC will make it more difficult for the Burundian government to protect its borders from terrorism. Meanwhile, ‘peaceful protesters’ are attacking police and lynching pro-government civilians with the full backing of the international military-industrial-media-intelligence complex. The protesters in the streets are chanting ‘’down with the dictator’’ and an ‘’end to corruption’’ but in reality, Nkurunziza is being targeted for not serving the interests of the infinitely corrupt scoundrels currently running the United Nations, the potentates of the soi-disant ‘international community’. The African Union has called on the Burundian government to postpone the elections. This is the same African Union which stood by and watched French forces bomb and invade the Ivory Coast in 2010, Libya in 2011, Mali in 2012, and the Central African Republic in 2013. If the African Union is to gain a modicum of respect, it must stand up for the sovereignty of African nations and threaten to lead a coalition of military forces to defend any country attacked by US/European imperialism. In the case of Burundi, the African Union should have denounced the diabolical terrorist and media disinformation campaign against a young democratic country which has just emerged from a civil war. The fact that they did not shows that they have sided with the enemies of Africa. It is hardly surprising that truly independent, post-colonial countries such as Eritrea will have nothing to do with the sham called the African Union. If the Burundian authorities do not succeed in crushing the violent insurgency, the country could be facing more years of civil war and permanent foreign occupation by UN ‘peace-keepers’ after a ‘humanitarian intervention’ to ‘stop the massacres’. The script has been tried and tested in Haiti, the Ivory Coast, Libya, Mali and the Central African Republic. So, the key question now is this: Can Burundi defy the Empire and protect its people from carpet bombing called ‘humanitarian intervention’, a terrorist invasion called ‘liberation’, a military coup called ‘transitional government’ and a possible genocide where once again the victims will be blamed?